Tax Freedom Day falls 3 days later this year. It’s now higher than at any time since 1995 (as far as the best quality data goes back). High taxes discourage work, investment, and economic growth. Every year, the Adam Smith Institute calculates the number of days the ‘average’ person (more on that later) would have to work just to pay off their taxes. This year, every penny the average person earned up until May 28th went straight to the taxman. From May 29th (Tax Freedom Day) onwards, the average person will get to keep every penny they earn. We calculate Tax Freedom Day each year to illustrate the true size of the tax burden once you factor in taxes from every source. While Tax Freedom Day is a simple idea in principle, in reality it’s a little bit more complicated. First, there’s no average person. Because we don’t have a proportional tax system, every individual will have a different tax freedom day. In theory, Tax Freedom Day will come later for high-earners and earlier for low-earners and the unemployed. In practice, this isn’t necessarily true because the HMRC does not simply tax income but also taxes consumption, investment and ‘sin’ activities at different rates. Thirdly, we take into account depreciation and foreign investment earnings, as is standard around the world, measuring total taxes over net national income, not gross domestic product, so as to more closely approximate net wealth creation rather than economic activity. Fourth, tax receipts and net national income statistics are regularly revised by the Office of National Statistics and we revise past Tax Freedom Days along with them . Last year, the ONS made massive revisions to the net national income series. Irritatingly, as a result records now only go back to 1995. However, while this year’s changes are bigger than in past years, the overall trend hasn’t changed substantially. We should still expect this year’s Tax Freedom Day to be below the levels seen in the late 70s/early 80s. The data for the most recent figures are not available up-to-date for calendar years so they are proxied from government and OBR forecasts and financial year numbers. They are then revised when exact numbers become available. This means the Tax Freedom Day for a given year in the past may well have changed. Typically the changes are very small, and the overall picture tends to be robust to these alterations. But over the past year, significant revisions to the net national income stats have pushed Tax Freedom Day back by around a week (we’re freer than we thought). Tax Freedom Day (and its sister, Cost of Government day, which measures total spending over national income) is not meant as anything but an illustration—an indication of the size of the state. As the complexities detailed above suggest, it does not correspond exactly to any individual's experience. And yet many people do find it shocking to see how large the state really is, expressed in an intuitive way. If you want further info, feel free to call up the ASI on 02072224995 or send us an email at samd@adamsmith.org. As you can see in the graph, Tax Freedom Day has trended later each year since 1995. The previous peak was in 2008 before the Great Recession. Under the Conservative/Liberal Democrat coalition Tax Freedom Day stayed relatively stable, increasing slightly at the end of the Parliament. Since 2015, the total tax burden (as a share of net national income) has increased with Tax Freedom Day nearly creeping into June. Since 1995, the trend has been for parties of all stripes to increase the total tax burden. Less reliable data going back over the past 40 years finds that tax burdens tend to fall under Conservative governments and rise under Labour governments. Recent data revisions are unlikely to have shifted this trend, but we can’t say for certain. Cost of Government day is calculated similarly, but for total government spending over national income—i.e. including debt-financed government activity, which we must eventually pay, as well as tax-financed government spending. The trend here is clearer. 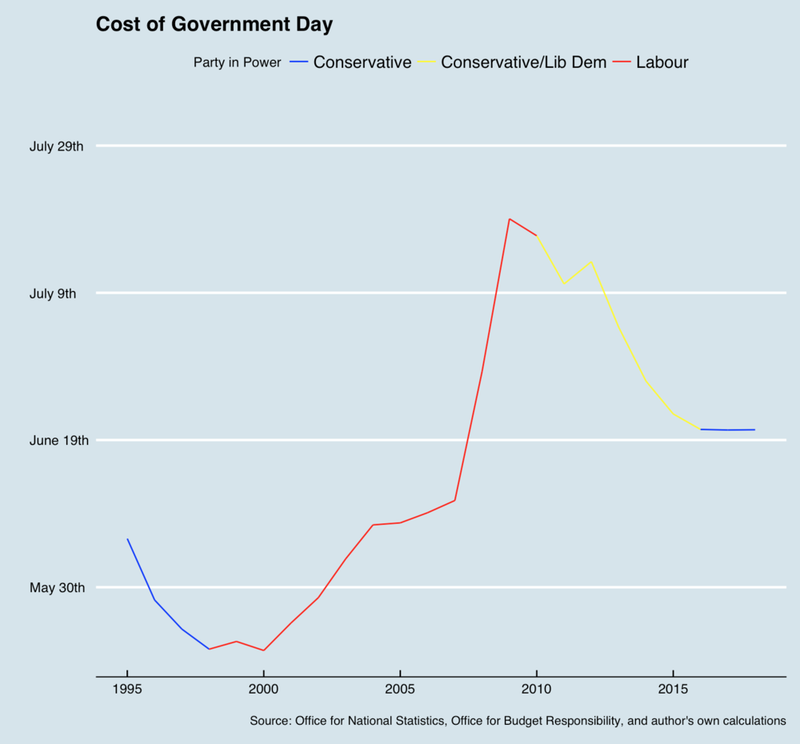 The true cost of government rises under Labour and falls under Conservative and Coalition governments. This trend is also found in less reliable historical data. Since 2009 the gap between Cost of Government Day and Tax Freedom Day has shrunk from 65 days to 23 days. We’re still not living within our means but significant progress has been made since the financial crisis.